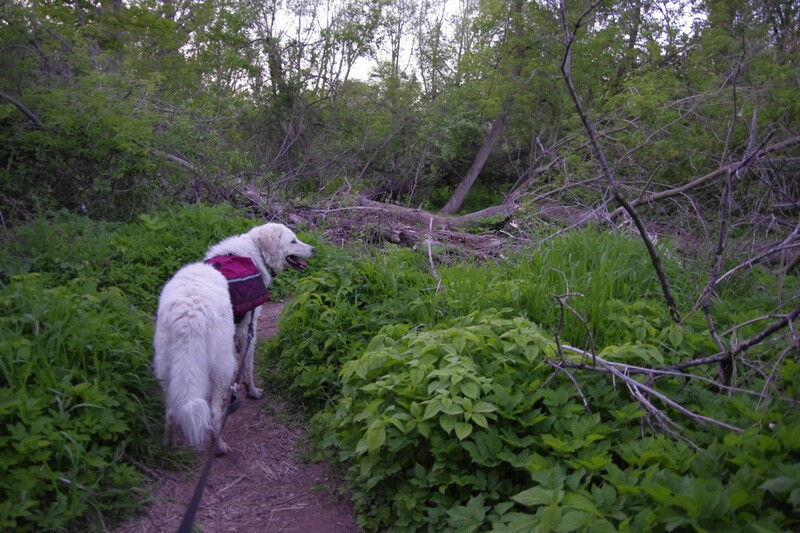 K2, the Great white Kuvasz, was on the leash and hiking about 6 meters (6 yards) ahead of me. It was a typical July hike on the side trail leading to Halfway Log Dump of the main Bruce Trail of the Bruce Peninsula National Park. Hiking toward the lakeshore was pleasant and offered no incident. We reached the beautiful but empty lakeshore and after a few selfies, I decided to return. It turned hot and humid. I began to sweat profusely. The smell of wildflowers and my sweat drenched T-shirt fused together into something that was undefinable. I had my eyes on the trail itself as trees had their roots spreading out on the soil surface like serpents, trying to get a hold of anything they could find. I didn't want to hurt my toes by hitting a protruding root. The sound of the waves breaking on the rocky shores gave way to total silence where I could hear the swishing of my clothes and thudding of the hiking boots in a vast expanse of timelessness. Occasionally, a gull flew overhead asking for a morsel of food. And then there is was. Turning a bend K2 stopped in his tracks looking straight ahead with a cautious look, ears cocked backwards. When I reached him, I was overwhelmed by the site too. There, just 20 meters ahead on the trail, stood a black bear looking at us. All three of us had just frozen. I begged K2 in my heart not to make any move. For the first time in my hiking adventure I realized how unprepared I was for such an occasion. I had no hiking sticks to act as a defense tool, no bear pepper spray, no advance warning to bear on our approaching it , e.g. having a bear bell on my backpack or on K2 to let bear know that an intruder is coming, etc.. In addition, I was holding leash of a puppy, who wasn't trained for such an encounter and could have irked the bear by making a sudden move. Having a big puppy on the leash had an advantage, as it turned out. I could restrain him from making an aggressive move. And if bear attacked, I could have let him go to at least act as a deterrence, or so I hoped. It all turned out well. The bear decided to break the stalemate. It moved off the trail and disppeared in the thick undergrowth. if K2 were off leash, there was a possibility of it running toward the bear and harassing it. Approaching a bear like that could have dangerous consequences. There was a possibility that if the bear counter-attacked, K2 would have taken to heels and brought the bear to me. See the video here on how a dog brought an unfriendly denizen of the forest back to its owner. Early spring to mid-spring, depending upon the region, in the bear country can also be life threatening. 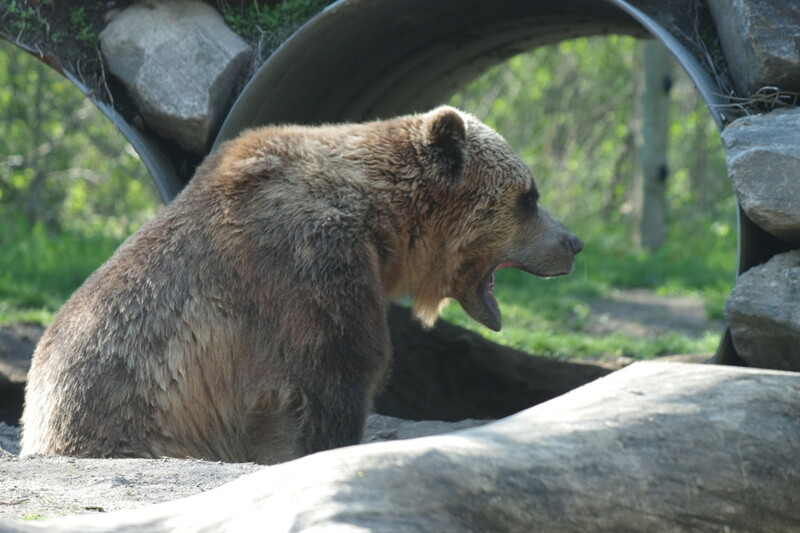 Both grizzlies and black bears are reported to initiate predatory attacks during this time of the year. The reason is that they have just come out of hibernation and they need to fill in their depleted energy resources quickly. Another situation that can turn life threatening mid to late spring is when you and your dog unintentionally challenge a mama bear (sow) with its cubs. 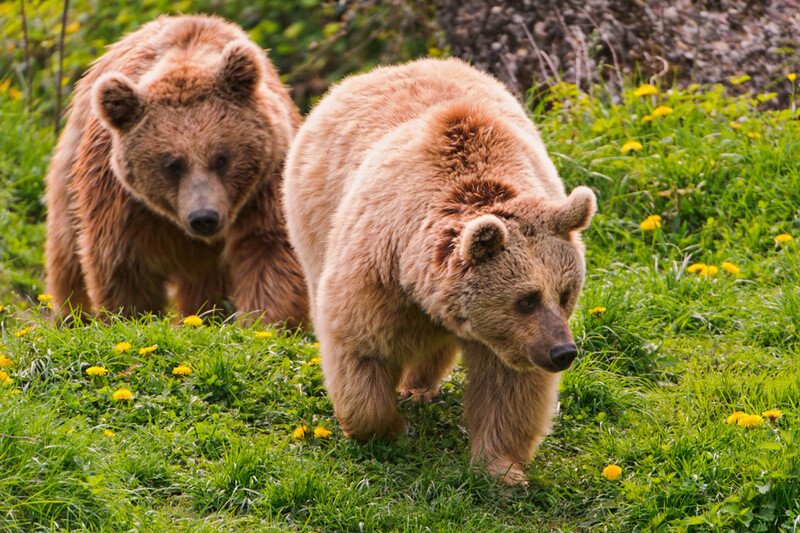 If the sow and cubs are on the same side of the trail you are hiking on, it may not be risky because the family will walk away to avoid any conflict. However, situation can be terrible if you and your dog happen to divide the family in such a way that the sow is on your one side and the cub(s) on the other. Rest assured mama bear will charge giving you very little time to release the dog and bring bear pepper spray out for defense, leaving you with your hiking stick to defend. An interesting story of a defensive attack by a grizzly mama bear appears under reference # 3. Bear encounter in winter season - really? Winter is a safe season to be in bear country for they are hibernating. If you do see a bear in winters, however, then it means you are in lot of trouble. That bear has been woken up from its winter sleep by an unexpected natural or unnatural event and is going to be thoroughly agitated. As far as I am concerned, I keep bear spray readily available in all seasons. Perhaps I am paranoid, but I feel a bear encounter in winters is now increasingly possible due to increased human interference in wilderness through winter activities. While references # 4 and 5 provide information on bear encounters, the following is my list of proactive measures against a potential hostile encounter with a bear specifically when hiking with your dog(s). In fact, these measures in themselves may prevent any hostile encounter. However, do remember that black and grizzly bears call in for separate strategies. For Tips for hiking safely in grizzly bear country, please read reference # 6. As described above, it is worthwhile to know upfront what is potentially aggressive bear behaviour at the time of the hike in the country. During hiking with your dog, it is very important that it knows to stand by you no matter what. It is not required of a dog to challenge a bear or a cougar or run after it when it sees one for a dog is no match for these wild animals, unless they are trained as in the video for bear shepherding. However, presence of a well-trained dog by your side can be an advanced warning system for presence of a bear nearby. K2 is now 3 years old. He is 29 inch tall at his withers and is 110 lbs. His agility and running speed has pleasantly shocked many a dog owners at the dog park. His size, agility, and because he is a livestock guardian dog with great protection drive, make him a good partner for hiking in bear country, but only when he is fully obedience trained. You should be aware of the capabilities of your dog when hiking in the bear country and be prepared accordingly. K2 has bonded with his humans rather than with a flock of sheep or goats. I started taking him on longer and longer walks with me since he was 6 months old in order that he eventually becomes a good hiking partner. I plan to put him through a special obedience training program, like the one video shows, so that he becomes a reliable partner to hike through the bear country. If your pooch is 'Obedience' trained then you have won half the battle already. A well trained dog on the leash is under your control. You really don't want to get into a situation like the one this video shows. If I were the man in the video, instead of shouting, I would have quietly retreated to a safer spot. A dog is much better equipped on its own to escape an attacking bear because of its agility. Keeping an encounter with bear on the side, German shepherds, dobermans, rottweilers, cane corsos, dogos, etc. are incorrectly perceived as dangerous dogs. A rottweiler coming down the trail off leash can run shivers through the spines of hikers with children in the party. This is with a view to letting a bear on the trail ahead hear about your approach and letting it slip away for the safety of both the parties. Like the one in the video here, I use a bear bell attached to my backpack rather than on K2 for the simple reason - a jingling sound can be hard on his ears and interfere with his normal auditory sense. Do remember to use dog's senses to your advantage. 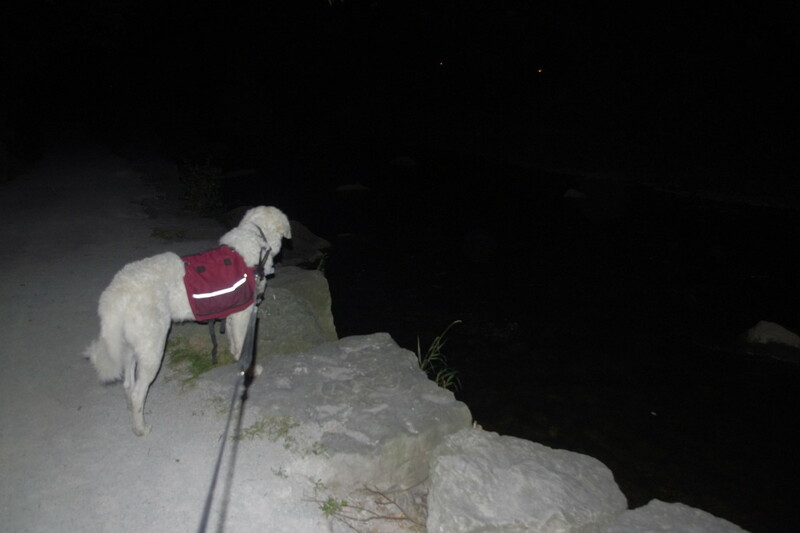 Dogs’ vision is roughly as good as ours, but they have better night vision, peripheral vision and motion detection that can be helpful while hiking in the dark. Their smelling and hearing senses are much better than ours and can be used to a distinct advantage. Their olfactory sense, especially, provides a window to recent past, present and therefore, near future. They can smell presence of a danger much before humans can. K2 already wears 3 tags on his collar (for showing vaccination against rabies, municipality registration, and his name and contact info of his humans), which constantly produce a metallic jingle of a mild nature for a bear to hear. If you two are out by yourselves, like K2 and I are, it may be worthwhile to keep talking to your furry friend, albeit it may appear to passing-by hikers that you are possessed. 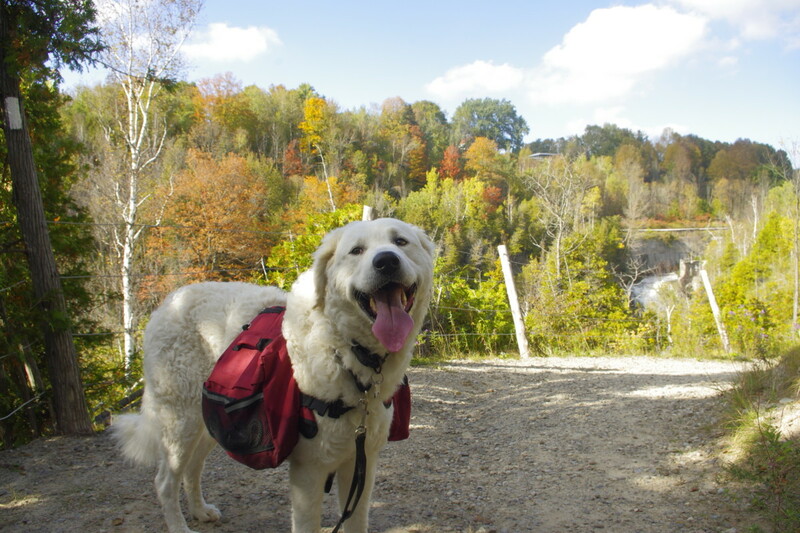 During the hike with your dog, you may be more interested in enjoying the nature, taking pictures, and keeping a casual eye every now and then on your furry friend. But do keep a bear pepper spray and hiking stick handy at all times. Hiking stick is always in my free hand for balancing myself. But I keep bear spray in a quick draw position too. The video shows a great way of carrying bear spray, especially for grizzly bear attack. Despite all the measures listed above, there is a slim chance that you and your dog may get attacked. This will in all likelihood be a case of a predatory attack or, more likely, a case of a defensive attack coming from a sow protecting its cubs or from a startled bear on or near the trail. In this case, trying to climb a tree or playing dead will not work. You will have to fight back. Here is a list of measures you can take to defend your dog(s) and yourself. If you have time, unhook the dog(s)' leash letting it fend for itself or take verbal commands. It is more likely that a fully trained and protection capable dog will take commands from you for putting up a combined defense or take cover behind you. Dogs in the video show that they make the bears run away not by brutally attacking them, but by harassing them due to their quickness. Even if your dog doesn't fight, it may flee for its safety, which is better than to get entangled with you and you both getting seriously injured. In a more likely event of not having enough time, drop the leash to get both hands free. A free dog even with a leash on may be able to fend for itself. You got to know how and when to deploy bear spray. There have been instances when the attack was so sudden that the victim didn't even have time to pull the spray out. Deploy bear spray as shown in this video, but remember that you have to consider safety of your dog as well. You better pray that the spray gets deployed against a grizzly bear attack. If it doesn't, the repercussions can be drastically terrible. If it is a black bear, prepare to fight back by using your hiking stick targeting bear's eyes. For more on fighting techniques, please read the reference articles # 4 and 5. There are thousands of hikers who hike with their dogs in bear country. Yet, there are exceptionally few, almost non-existent, instances of bear attacks on them. But the instances, no matter how few, are there and they have been horribly brutal. I strongly recommend all hikers to be prepared for the worst case scenario. In the end, it will pay. Repelling a habituated, food aggressive or a defensive bear. Have you ever heard of the Karelian Bear Dog or KBD? If you have not, it is not too surprising as this breed has only been in The U.S. since the mid 1980s. This breed is originally from, you guessed it, Karelia; an area in Northern Europe which is..
A dog attack is surely to be blamed on its owner. In a crowded place there is no reason that a dog is not on the leash or not under full control of the owner. Than's for sharing. I've been attacked by Dog where I was camping near the village. Next time will be carefull and prepare enough when we go to camp in such a kind of area.. I am lucky too for not encountering a hungry, fearful, or over-curious bear. I am glad you liked my advice. I always walk with a walking stick, but wish I would have though of the bells I never saw the bear and just kept walking, so lucky. Great advice. Thank you for reading my article. 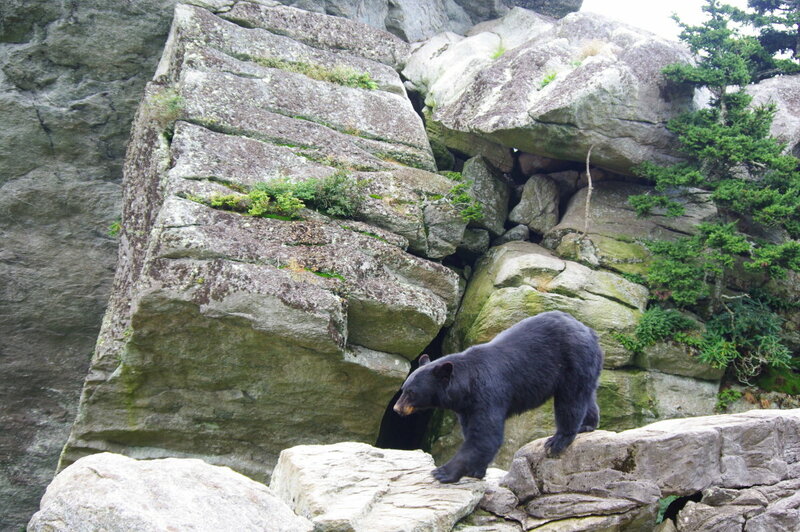 Since black bears are present in almost all US states and Canada's provinces and territories, knowing about them is essential for any hiking trip here. Thank you, Cynthia for providing an update from your side. Yes, I am 100% sure, your little pooch will 'squeal' a bear away. If i am hiking in BC, I would be extremely cautious and nervous. Not only you have bears, but also cougars and wolves. So no BC and Alberta for me hiking with my dog, yet. Ontario is OK for now. Perhaps you would like to share some stories about your husband's adventures someday soon. A hike for 8 days can be an ultimate fun in adventure travel. Dear Suhail, This is an awesome hub! I grew up in bear country in Northern Saskatchewan and have great respect for these animals. I now live on Vancouver Island in a rural area where we often have reports of bear and cougar sightings. I hope never to see either, I'm that "respectful" (read: terrified) inspite of my outdoorsy son and husband reassuring me that the animals are more afraid of me than I am of them, etc. etc. I had to chuckle at the video of the little Schnauzer taking on the Grizzleys... our little dog is apt to do that (she is part Schnauzer) and I believe she would 'squeal' them away. My hubby just did a hike on the rugged, fairly new, North Coast Trail but there are no dogs allowed there. They saw a few bears, but only from a distance (thank God) because they were out there for 8 days with no cell signal and only saw a forest ranger from a distance their last day there. They did have 2 cans of bear spray, though. Anyhow, very interesting, and I am passing this along to the woodsmen of the family. Voted up and awesome, shared and pinned. Thank you, Nell, for reading my article. We have silly people doing silly things in the back country that puts them in precarious situations with wildlife. You won't believe how many people I have seen getting out of their cars to take photos of a bull moose when signs close by exhorted tourists not to do the same. Thank you, Jim. A well trained dog is definitely an asset as many friend camping out there have also suggested. Dogs can act as a good watch dogs without giving a chase to those bears. Great information. I encountered a bear in the mountains once, and wish I would have had your dog. Knowing what to do when you do have a dog with you is also very important, such as what you mentioned about the dog bringing the bear back to you. Great advice from a great animal lover who is always on the field! This is very wise, as well as proactive advice. When living at home in Maine, when bears awoke, they'd look anywhere for easy food, which meant bird feeders. Once you're on a bear's trail, they will ALWAYS come by your residence. Do NOT feed them. If you encourage these animals, chances are better than you will have a run in. They will even try to gain entry to your home if they think there are easy pickings. It is best not to invite trouble from a bear that wants to eat. Be smart, stay alert. Thank you, Alicia. And that is precisely my point. The probability of encountering an aggressive bear is low, but if it happens at all, the consequences can be terrible. Therefore, one has to have precautionary measures at all the times. Thanks for sharing this very useful information, Suhail. I have encountered black bears a few times, but luckily they have always moved away when they sensed my presence. The possibility of meeting an aggressive bear is always at the back of my mind when I hike, though. It is likely that Wales, England, Scotland and Ireland may go for rewilding its wilderness. 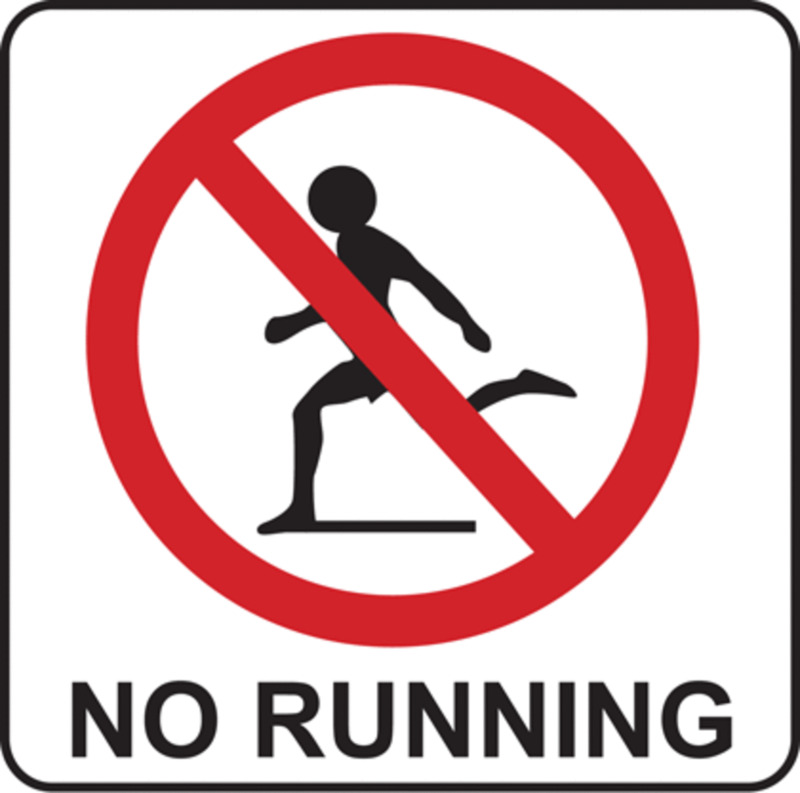 Then, there will be a possibility of running into wolves, at least, in Ireland LOL. Yes, I have done my part by writing. After all, what is "World without writing"? Thanks for reading and leaving this comment. I have presented my case through personal experience and researching others' material and I hope that hikers - humans and their furry friends - are able to learn from it. I am living only a tad dangerously, because we only have black bears in southern Ontario (and coyotes), but I shudder with fear when I see people hiking with their dogs in extremely dangerous bear, wolf, and cougar country without any regard for their lives. I am not likely here in Wales to walk into the situation you describe here but I loved reading all about your hiking adventures and will continue to do so. Great work and all told so naturally. I'm so glad there was a happy ending. You did provide some excellent information for people just in case. Especially as environments of humans and bears are coming into closer contact it is so important to have this information. Some people camp with their dogs so they need to remember this. Gosh, you live dangerously. I'm so pleased it all worked out happily for you and your fellow hikers and of course K2. 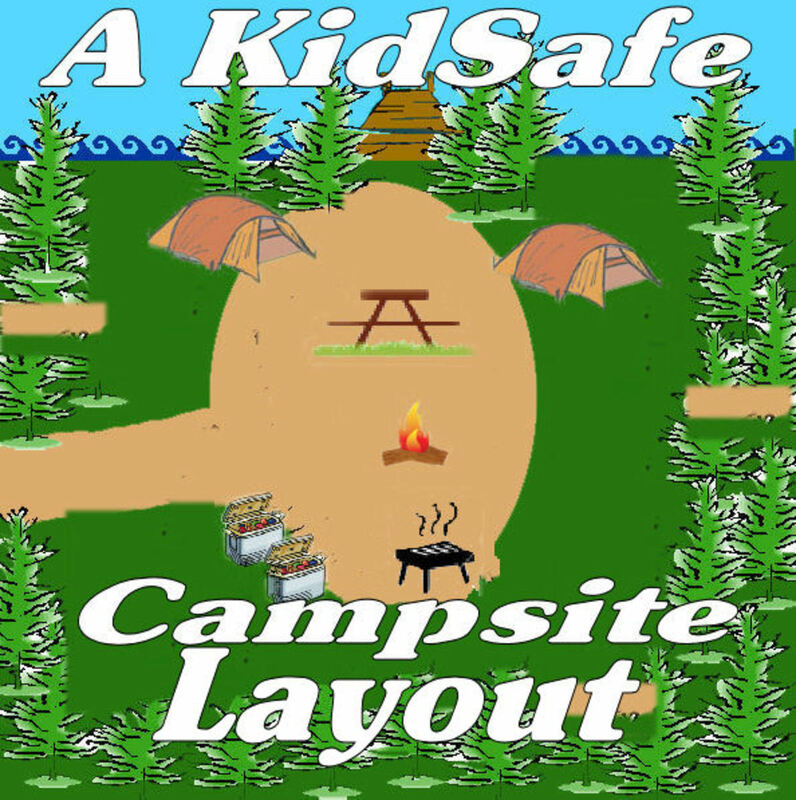 A most interesting hub to read and packed with information for all hikers in the area. I appreciate your feedback, because you are the most active outdoor enthusiast on hub pages. In fact, I am paranoid and at one time carrying two bear pepper spray canisters as extra precautionary measure. But hiker's better sense prevailed soon. According to a report published recently, bear attacks are on the rise. The report cites the same reasons as you did. Helpful article Suhail, and not just for hikers that venture into the backcountry either. 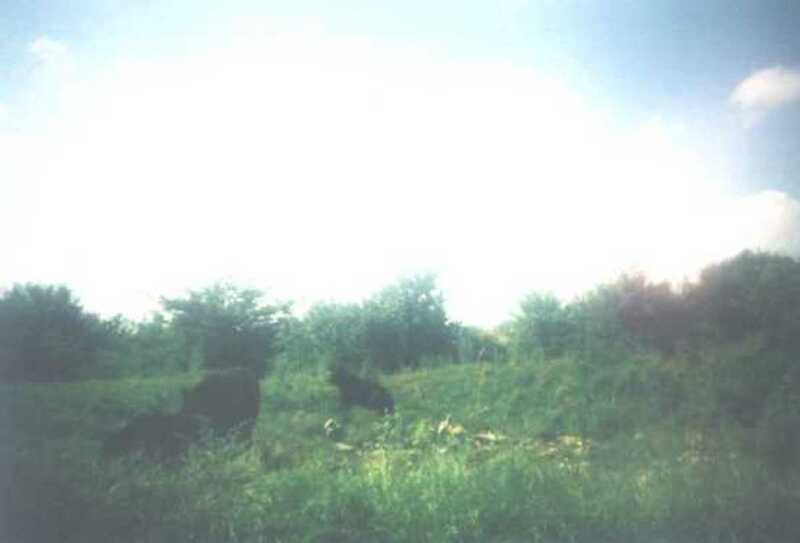 Here in NY, the diminishing traditional black bear habitat has pushed them into the suburbs and more populous regions. When I was a kid, it was unheard of to see a bear in my neck of the woods, but now we hear reports of them right outside of cities. Therefore it is wise to be prepared for a bear encounter even in non-traditional bear habitat. As a hiker I've never had an issue with bears, but I keep my camp clean and I'm careful with food. Most bears run away as soon as I pull out my camera... Other hikers I've know have told me horror stories of defeated bear canisters, ruined gear and frayed nerves. The thing is, you have to be prepared for whatever you may encounter. Bill, the problem I am seeing is that lot of people are hiking with their dogs unleashed in bear and wolves country. That is a total no no for the safety of dogs, ourselves and wild animals. Great information my friend. I've done quite a bit of hiking in the backwoods, so I knew a lot of this....an ounce of prevention and all that. You can't be too careful in the wild. Thank you Genna for the kind words. One thing that went in my favour was that I was hiking in Bruce Peninsula where, due to the geological features and habitat limitations, wildlife is generally of smaller size. Black bears too are smaller than the average. Thank goodness that Bear decided not to checkmate you and K2. You were fortunate. I enjoyed this hub, and the sage advice on what to do in order to get ready for the worst possible scenario. One can never be too prepared. I have heard that grizzly (brown bear) attacks are the worst. Excellent reading; very informative, as well as the videos.